Due to a switch-over in internet stuffs yesterday, I stopped in the middle of creating this post and was so distracted I never came back to finsih. So…a little later than I normally post but this treat is yummy, I think it’s worth the wait. 😉 As y’all probably know, I’m a total sucker for sticky buns. And caramel is a favorite flavor so this easy treat has double appeal for me. 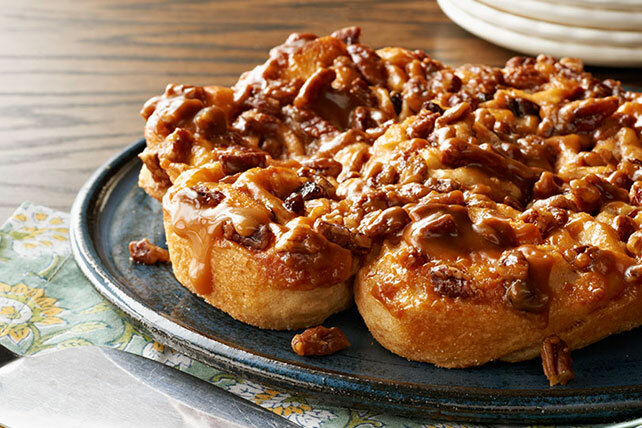 Refrigerated crescent dough is topped with sugar, cinnamon, pecans and raisins, rolled up, sliced and baked in gooey caramel for a breakfast treat. As always, CLICK HERE to get all the deets from the Kraft kitchens. This entry was posted in Writing Life and tagged characters, food, Moonstruck, recipe, Tuesday Treats. Bookmark the permalink. Oh, that’s just wicked. Yay!